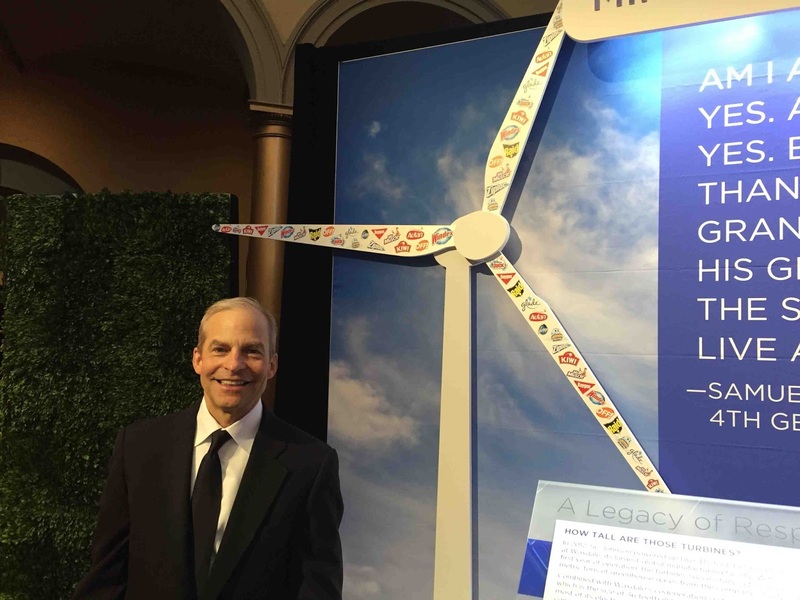 On May 14th, Racine, WI-based SC Johnson was honored by the World Environment Center as the recipient of the 2015 Gold Medal for International Corporate Achievement in Sustainable Development. This is a major award amongst large multi-national companies, and only one company is recognized each year. SC Johnson became the second company to win the award twice, after first receiving the award in 1994. Recipients from recent years include Volkswagon Group, Unilever, IBM, and Wal-Mart Stores. With financial support from SC Johnson, I attended the event in Washington, DC to help honor the company. RENEW’s relationship with SC Johnson started about four years ago, when our Program and Policy Director Michael Vickerman advised the company as it was pursuing the installation of two wind turbines to help power Waxdale, one of its major factories in Mt. Pleasant, Wisconsin, near Racine. According to SC Johnson, Waxdale produces an average of 100 percent of its electrical energy onsite each year. Glade®, Windex®, Pledge®, Scrubbing Bubbles®, Shout®, Raid® and OFF!® are all among the trusted household products made at Waxdale. After winning two court victories in the past 12 months, RENEW Wisconsin is seeking another legal triumph. RENEW Wisconsin and The Alliance for Solar Choice (TASC) are teaming up in a legal challenge to a Wisconsin Public Service Commission's December 2014 decision, which approved a "tax on clean energy" for customers choosing to power their homes and businesses with renewable energy in We Energies territory. RENEW and TASC argue there is insufficient evidence in the record to support the added tax, and are asking the Dane County Circuit Court to reverse the PSC's decision. RENEW Wisconsin and TASC filed their legal arguments on Thursday, May 14th. Our press release below highlights our arguments. To help fund our lawsuit and our continued advocacy work for expanding clean energy in Wisconsin, please visit our website. Donate now, and help us get bigger and stronger to take on We Energies. 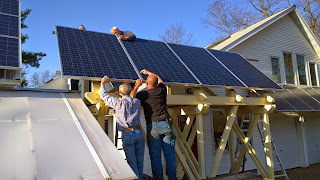 MADISON, WI – May 14, 2015 – The Alliance for Solar Choice (TASC) and RENEW Wisconsin today took their next steps in appealing the Wisconsin Public Service Commission’s December 2014 decision to add a discriminatory fee on distributed generation customers in We Energies’ territory. The groups filed the first set of briefs Thursday, which outlined their arguments in the case. TASC and RENEW Wisconsin explain in the briefs how the record does not contain the necessary evidence to support the Commission’s approval of the additional charge on customer generation (like solar energy). 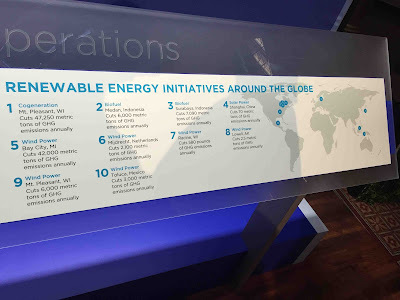 In fact, Heart pointed out that We Energies’ own study of the costs and benefits of solar in their service territory found that these customers provide a net benefit to all ratepayers. “Unfortunately, the Commission, knowing the benefits, still approved fees for these self-generating customer, which was legally improper,” said Heart. This is the third case in the past three years seeking judicial review of a decision of the Public Service Commission of Wisconsin that discriminates against owners of small distributed renewable energy generating systems. In the previous two cases, the Dane County Circuit Court also remanded all or part of the new rates as lacking a factual basis in the administrative record. The We Energies rate case in fall 2014 sparked unprecedented public opposition and national attention for the three-member Commission, with over 500 Wisconsin residents in attendance at a public hearing in October. Along with the discriminatory rate changes, both groups protested Commissioner Ellen Nowak’s lack of impartiality during the proceeding. About The Alliance for Solar Choice: The Alliance for Solar Choice (TASC) leads the rooftop solar advocacy across the country. Founded by the largest rooftop companies in the nation, TASC represents the vast majority of the distributed solar market. About RENEW Wisconsin: RENEW Wisconsin leads and accelerates the transition to Wisconsin’s renewable energy future through advocacy, education, and collaboration. RENEW represents over 50 Wisconsin businesses in the renewable energy industry and hundreds of customers who have installed their own renewable energy systems. The below article appeared in the Sunday May 3rd edition of the Wisconsin State Journal, and argues that the Joint Finance Committee should restore funding for CUB and other advocates to ensure ordinary ratepayers have a voice on their side. When you spread the cost of the Citizens’ Utility Board across all of the ratepayers in Wisconsin, it’s no more than a penny a month on your utility bill. “I actually think it’s less than that because it gets spread across electric bills and gas bills and water,” CUB executive director Kira Loehr said Thursday. That penny provides a lot of pop for the public. CUB has successfully argued before the state Public Service Commission against rate hikes sought by utilities. Those efforts have saved ordinary ratepayers — homeowners, renters and small business people — real money. In the last year alone, CUB has helped convince the PSC to reduce proposed rate hikes saving customers more than $160 million. The PSC might have scaled back some of those utility requests on its own. But the professional analysis and testimony of CUB played an important role. Unfortunately, CUB is now at risk. The Legislature’s budget committee just nixed the $300,000 payment and made it harder for CUB to hire outside experts to testify at hearings on behalf of consumers. Republicans who control the Joint Finance Committee claim the change will save ratepayers money. Sure, a few pennies a year. But that savings will be imperceptible and will certainly lead to costly hikes in utility rates over time. That’s because CUB’s four-member staff won’t be carefully following and sticking up for ratepayers in dozens of cases before the PSC. The PSC lets utilities hire expensive lawyers and consultants to plead their cases for higher rates, with the cost of that advocacy passed on to ratepayers. So it’s only fair for ordinary ratepayers to have a voice, too. The Metropolitan Milwaukee Association of Commerce is spearheading the effort to scrub CUB, according to the Milwaukee Journal Sentinel. The MMAC has disagreed with CUB in cases affecting how much Milwaukee businesses, versus general customers, will pay for power. You can’t fault MMAC for trying to control its costs. But you should fault the Joint Finance Committee for trying to eliminate a strong advocate for ordinary ratepayers. Even utilities are defending CUB’s important role. “We felt the CUB funding worked fine,” Gary Wolter, CEO of Madison Gas and Electric, told the State Journal editorial board Wednesday. If the Joint Finance Committee doesn’t restore CUB funding, the full Legislature should. Ratepayers need this cost-effective advocate on their side.